Jones Snowboards wants everyone to be safer in the backcountry apparently, and they’re doing it with an all-new Snowpulse compatible 30l R.A.S. Ready backcountry pack. Weighing in at 6.7lbs when loaded with the R.A.S. 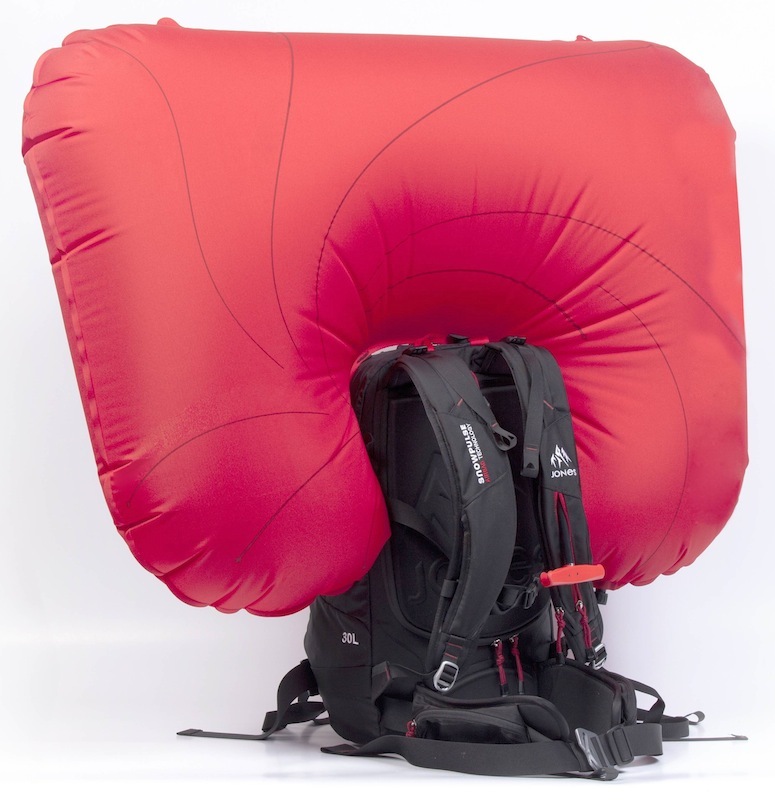 (Removable Airbag System), the new Jones 30L R.A.S. Ready Pack has all the technical features of the standard 30L pack combined with additional pockets that hold the Snowpulse R.A.S. system. The 30L’s R.A.S. system pockets allow you to use the pack with or without the airbag installed and utilizes compressed air instead of nitrogen, so you can easily deploy the bag for storage before a plane trip, and then easily refill the canister at your destination. If you ride in the backcountry, be ready, be prepared for the moment. Jones Snowboards continues to push this belief front and center at the 2013 Winter Outdoor Retailer and SIA trade shows with the launch of the Snowpulse compatible 30L R.A.S. Ready technical backcountry pack. The new 30L R.A.S. Ready Pack will be available to consumers Fall 2013. A lightweight and technical snowboard carrying backcountry pack, the 30L R.A.S. Ready Pack features a large cargo compartment, quick access avalanche tool pockets, padded waist straps with dual hip pockets, fine adjustment shoulder straps, thermo molded neoprene foam back padding, fleece lined goggle pocket, and a back panel zipper for easy access to gear. Made from ultra durable Dimension polyant ballistic nylon with aramid fiber, the 30L R.A.S. Ready Pack will take a beating and keep performing in the harshest conditions. For more information on Jones Snowboards product, news and team happenings, visit www.jonessnowboards.com.